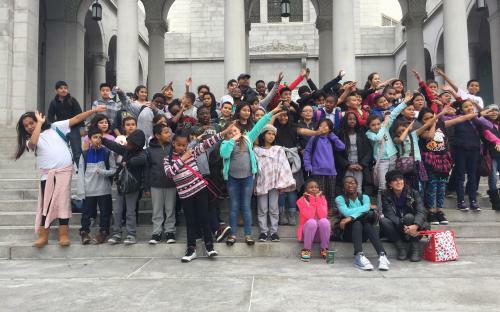 75 fifth grade students from the 116th Street School visited Los Angeles City Hall on Fri. January 13, 2017 for a tour and introduction to how local government works. The trip was coordinated by HGNNC Youth Representative Richard Lee. HGNNC District 8 Representative Larry Morrison helped with trip supervision. Councilmember Buscaino’s office arranged for the bus and the Councilmember introduced the students, including four of their student body leaders (all girls) at the beginning of the day’s City Council meeting. LOS ANGELES (CNS) >> The Los Angeles Department of Water and Power’s Board of Commissioners on January 17, 2017 approved a “customer bill of rights” backed by Mayor Eric Garcetti and criticized by some leaders from neighborhood councils, but also moved to open up public comment and revisit the bill of rights in about 90 days. The commissioners unanimously approved the provisions of the bill of rights, which includes assurances that call wait times will not exceed three minutes on average; bills that exceed three times the average historic use for the same billing period will automatically be reviewed before being sent out; and requests to start a new residential account will be processed within one business day. Customers will receive rebates or credits if the guarantees are not met. For example, if the department takes longer than 10 days after a final inspection to process a new business service connection of 200 amps or less, that business will receive a $25 credit. The bill of rights was detailed by Garcetti an hour before the LADWP commission’s meeting on Jan. 3 and was scheduled to be voted on at that session, but the vote was postponed to allow for public comment. Some leaders of neighborhood councils were critical that the bill of rights was not given much public notice before being placed on the Board of Commissioners’ agenda. 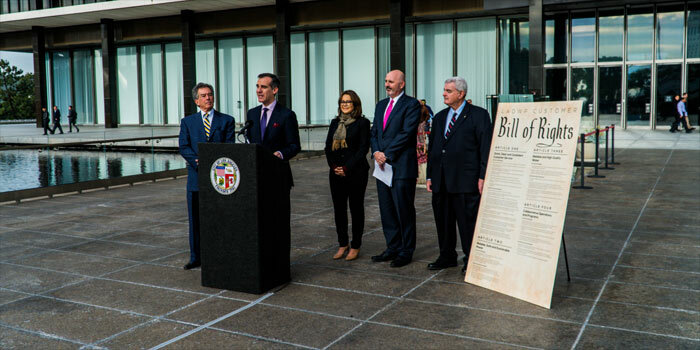 The bill of rights does not require the approval of the Los Angeles City Council and would become active if the commission reapproves it or makes any adjustments to it in 90 days, said Amanda Parsons, media relations manager for the LADWP. Glenn Bailey, treasurer of the Los Angeles Neighborhood Council Coalition, complained on Jan. 3 that the initial bill of rights vote was scheduled without any public notice of its details. When David Wright was confirmed by the council in September as the LADWP’s general manager, Garcetti said one of the first tasks he wanted him to undertake was developing and implementing a customer bill of rights. The LADWP has been rocked publicly by a number of scandals in recent years, and the customer bill of rights directly addresses some of the problems that have emerged, including long telephone wait times and a glitchy billing system unveiled several years ago that wildly inflated some customers’ bills. A Los Angeles County Superior Court judge granted preliminary approval in November to a class-action settlement expected to result in at least $67.5 million refunded to LADWP customers over the billing system. At Garcetti’s news conference on Jan. 3, LADWP officials said average call wait times had been cut to under a minute over the last 10 months. Wright said the department is ready to stand by the bill of rights, thanks to the increased personnel that have been hired over the last two years, including 300 customer service representatives and several hundred new billers.